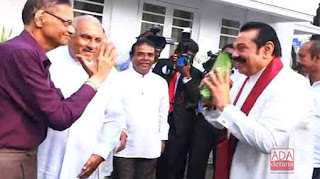 Opposition Leader Mahinda Rajapaksa has assumed duties at the Opposition Leader’s Office in Colombo this morning (18), said Ada Derana reporter. Chairman of Sri Lanka Podujana Peramuna G.L. Peiris, MP Susil Premajayantha, MP Gamini Lokuge and several other parliamentarians had joined this event held at the Marcus Fernando Mawatha, Colombo 07. According to political sources, former Opposition Leader TNA MP R. Sampanthan had not returned the office of Opposition Leader until recently. However, on January 08, Speaker Karu Jayasuriya had informed the Parliament that the United People’s Freedom Party (UPFA) MP Mahinda Rajapaksa has been accepted as the Leader of the Opposition. Accordingly, Mahinda Rajapaksa assumed duties in the Opposition Leader position today. Addressing a press conference afterwards, Rajapaksa said that he is back in office as the Opposition Leader and he would be committed to resolving the issues, not only of the people in the North and East but of all Sri Lankans. He also commented on the obstructions levelled at democracy at present and on the “Sena” caterpillar menace.